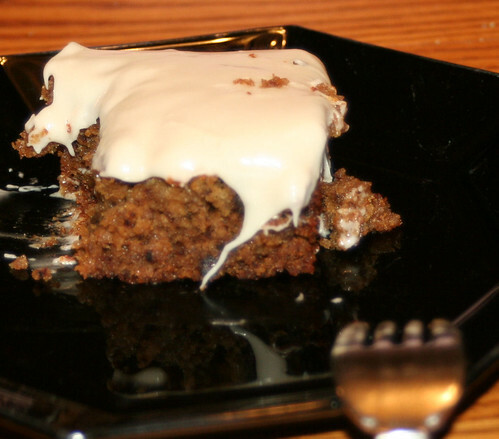 I am still swimming in applesauce over here, so what better to make than an applesauce cake. If this doesn’t say “Fall”, then I don’t know what does. 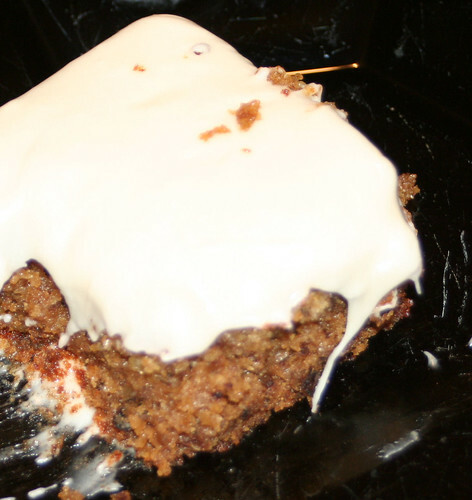 The cake is moist and is paired with a maple frosting that totally makes the cake. Here is a picture of the cake, frosted, a little messy. I almost forgot to take a picture I was so excited to eat it! LOL! This cake is very easy to make. I used Pamela’s Baking Mix, but you could use any combo of GF flours or even regular, all-purpose flour if you don’t have to eat GF. I think the most time consuming part is the frosting. The frosting is very sticky and wanted to create a bunch of crumbs on my cake. I had a long, stressful day and was not feeling the love when I frosted the cake, so I really didn’t care. I just wanted to eat it! LOL! Maybe a tsp or 2 of milk or water in the frosting will help smooth it out. I also left the nuts out b/c I ran out and my kids aren’t wild about them. 2 1/2cups all-purpose flour (I used Pamela’s. Don’t forget to add Xanthan Gum if you are making this GF and your mix doesn’t have Xanthan gum or guar gum in it). Maple-Nut Buttercream Frosting or Cream Cheese Frosting if you want instead. 1. Heat oven to 350. Grease bottoms & sides of 13 x 9 x 2 pan or 2 round pans, with shortening; lightly flour. 2. Beat all ingredients except raisins, nuts and Frosting in a large bowl with electric mixer on low speed for 30 seconds, scraping bowl constantly. Beat on high speed 3 minutes, scraping bowl occasionally. Stir in raisins & nuts. Pour into pan(s). 3. Bake rectangle for 45 – 50 minutes, rounds 40 to 45 minutes, or until toothpick inserted in the center comes out clean. Cool rectangle pan on wire rack. Cool rounds 10 minutes; remove from pans to wire racks. Cool completely. 4. Frost rectangle or fill and frost layers with Maple Nut Frosting. 1. Mix sugar and butter in medium bowl. Stir in syrup. 2. Beat until smooth & spreadable. Stir in nuts. 3. Frosts one rectangle cake or fills and frosts one 8 or 9 inch layer cake. So, last week I had posted about baking being a stress reliever for me. I think I may want to revise that statment. The baking itself is relaxing for me. The clean-up, not so much. Since my baking spree began a few weeks back, I have done more loads of dishes than I care to count. Last night was the final straw. I just simply couldn’t do any more. I am taking a hiatus from baking at least through the weekend so that I can concentrate on some other stresses that I have going on right now. Yes, I will still cook our meals, but the added disasters I was creating need to come to an end for the short time being. I think my new goal will be to aim for only 1 baked good per week. That doesn’t count our bread b/c it goes in the breadmaker and really doesn’t make much of a mess. Also, Jon and I go through a loaf in a week, easily. Especially with his new found love of Cinnamon-Sugar Toast in the AM. That looks great. Thanks for the recipe! This looks awesome. I especially love the idea of pairing it up with the maple-flavored frosting. I can’t wait to try both – just have to go do the shopping for the month – we’re on “E” for everything:( I especially liked showing the picture of your son to my son who is 5. He was very interested to see another Celiac kid. Looks like a taste of Fall. Can’t wait to try it. Thanks! Wish I could send you some Kelly! Debbie….glad your son enjoyed seeing a picture of my son. 🙂 Let me know if you end up trying the cake. Hi. Thank you for this recipe. I am newly (4mnths) diagnosed. So I am just starting to bake again. I do level my dry mix. 🙂 I suspect that it may have been b/c it was frosted while it was still warm. Also, when I made this cake, I only did a single layer, 13 x 9. It is a very moist cake, may not stand up to 2 layers. Thanks for trying it out! I am sorry that the results were less than what you had hoped for. Hi Kim, Thank you for your reply. I will try it again in a single layer. My Mom says we nonglutenavors really enjoyed it anyways. And that is true!! It was very tasty. Just went squishy. I will let you know how it turns out next time. Have you tried making it as cupcakes? No, I haevn’t tried cupcakes. I would probably just use Pam in the pan and not the cupcake liners, though. Since the cake is so moist, it may stick to the liners. Another thought, maybe cut back on the water or applesauce to make it a little “firmer”. Hi Kim, I will let you know. I made the Betty Crocker yellow cake mix as cupcakes. But I used liners and i think the paper drew the moister out as they were a little dry. Thanks again for your wonderful recipe and help. Yum, this looks delicious. Thank you for sharing it on Friday Foodie Fix.